In a video obtained exclusively by Sahara Reporters through salkida.com, the Abubakar Shekau faction of the dreaded Islamist terror group, Boko Haram, recorded dozens of its fighters driving into Maiduguri, capital of Borno State, in military painted trucks with little opposition from the military. In the first 23 minutes, the video shows the Islamist insurgents’ attack on Maiduguri, displaying uniforms, shoes, ID cards, arms and ammunition the group claimed their fighters seized from the military during the attack. A video obtained exclusively by Sahara Reporters through salkida.com, the Abubakar Shekau faction of the dreaded Islamist terror group, Boko Haram, recorded dozens of its fighters driving into Maiduguri, capital of Borno State, in military painted trucks with little opposition from the military. In the first 23 minutes, the video shows the Islamist insurgents’ attack on Maiduguri, displaying uniforms, shoes, ID cards, arms and ammunition the group claimed their fighters seized from the military during the attack. The mercurial Shekau, who remains alive despite several claims by the Nigerian military that he had been killed in operations, appears in the middle of the video. Speaking in Arabic and Kanuri, he repeats some of the earlier claims by his commander, who spoke in Hausa. According to him, “It is not true that all the attackers were killed in Maiduguri on that fateful night. It is not true that we were overcome during the attack. The battle in Maiduguri was successful,” he says. Remarkably, unlike in the past year where his video appearances were recorded indoors, the latest video features Mr. Shekau outdoors in an open field flanked by armed militants in front of armored tanks and trucks mounted with anti-aircraft machine guns. The factional leader of Boko Haram reiterated his group’s determination to fight on, adding that there was no room for any dialogue. He cited Somalia, Afghanistan, and Syria where Islamist groups have waged longstanding wars. 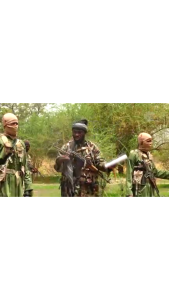 Mr. Shekau rebuked those who have been claiming that the Islamist group’s war around Lake Chad was over. “Our kids and grandchildren will continue from where we stopped,” he vowed.